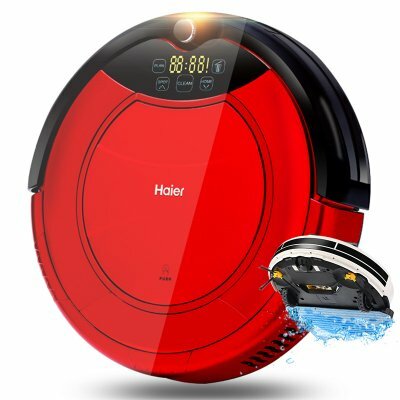 Successfully Added Haier Pathfinder Robot Vacuum Cleaner - Dry Cleaning, Wet Cleaning, Auto-Recharge, 800Pa, Different Cleaning Modes (Red) to your Shopping Cart. With the Haier Pathfinder robot vacuum cleaner, you can be guaranteed that your household always looks spick and span when you arrive back home. This smart home cleaning aid features intelligent software that allows it to clean your property on its own. Therefore, you’ll never have to lift a finger again and waste time on boring and time-consuming cleaning chores. With its four different cleaning methods, this robotic vacuum cleaner is fit to be used in any environment. It features a low noise production of merely 50dB. Thanks to this, your cleaning aid will keep your home tidy without causing any disturbance. The robot vacuum cleaner features 800pa high-power suction. This means that you’ll be able to use it for cleaning dust, dirt, and small objects such as cigarettes and seeds. With a 0.6L dust bag, your cleaning aid is capable of cleaning your household several times without needing to be emptied. Thanks to a powerful 2000mAh battery, the Haier Pathfinder robot vacuum cleaner can vacuum your home for up to 90 minutes straight. Whenever it is running low on energy, it will automatically return to its charging dock where it will recharge itself before returning back to its cleaning routines. With its TAC smart sensor, the Haier Pathfinder robot cleaner is capable of effortlessly navigating itself through your household without causing any collisions. It will clean any corner of your room without leaving a spot untouched. You’ll furthermore be able to set up virtual walls in order for it to only clean a specific area of your home or office. The robot vacuum is capable of passing over 3CM obstacles and features a 120 square meter cleaning area. With its large water tank, this smart home gadget will vacuum and mop your floor at the same time. The Haier Pathfinder Robot Vacuum comes with a 12 months warranty, brought to you by the leader in electronic devices as well as wholesale electronic gadgets..